Dr. Kreamer has carried out research on many water related topics, particularly the fate and transport of environmental contaminants, non-aqueous phase liquids, vadose zone hydrology, radioactive waste disposal, groundwater hydrology, landfills, monitoring well design, and water resources management. He has been an invited lecturer at many conferences including a presentations in Brazil for American Participant Program administered through the executive branch of the U.S. government, in Israel for the U.S. Environmental Protection Agency (jointly with the Israeli Ministry of the Environment), and throughout the United Kingdom at many universities and government agencies. He has given national lectures and training for the U.S. Environmental Protection Agency, the U.S. Bureau of Land Management, the Superfund University Training Institute, and the National Ground Water Association. Additionally, David has presented workshops at the Hanford Nuclear Site and for the States of Alaska, Arizona, Idaho, Minnesota, and Virginia. Dr. Kreamer has been an external peer reviewer for risk assessment and remediation methodologies at the Rocky Flats Plant as part of the Rocky Mountain Consortium, has been an external peer reviewer for the Early Site Suitability documentation for the hydrology of Yucca Mountain, and has been a member of the U.S. EPA's Science Advisory Board subcommittee on carbon-14 migration as carbon dioxide gas from high level nuclear waste repositories. He has worked at many CERCLA and RCRA sites, including Johnston Atoll in the Pacific Ocean, was a 1997 recipient of the Joseph Malone Fellowship, and has authored over 50 professional publications. 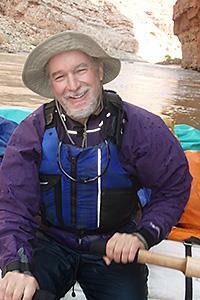 Dr. Kreamer has visited and hiked the Grand Canyon since the sixties, began initial sampling in the early 1970's, and has been an oarsman and paddler on the Colorado River, through the Grand Canyon, since the early 1980's. His research in the Canyon has intensified in the last ten years, with the increasing proposals for exploitation of groundwater on the Coconino Plateau near the Grand Canyon National Park. Support and cooperation for Dr. Kreamer's research has been received from many groups, including the National Park Service, the non-profit Grand Canyon Association, and the U.S. Environmental Protection Agency.